Leland J. Webb was a descendent of Richard Webb who emigrated to this country in 1626. All of his ancestors served with distinction first to their King and then to their country. A great grandfather served as Aide de Camp to General George Washington. His father served in the Union Army. On October 15, 1861, at the age of 15, he enlisted as a drummer in Company H, 16th Wisconsin Infantry. He was discharged August 25, 1862. Returning to Wisconsin he re-enlisted in Company I, 30th Wisconsin Infantry as a musician and was discharged March 8, 1865. He served in several major engagements including Shiloh, Nashville and Corinth. He moved to Ft. Scott, Kansas in 1868 and served with the 19th Kansas Volunteer Cavalry in service against the indians. On December 11, 1869, he was admitted to the bar. He served as the first mayor of Columbus, Kansas. In 1870 he was elected to U.S. House of Representatives. He married Helen Herman in 1870 and had two children. His son died in infantcy. His daughter later married Harry J. Wells of Topeka. He served a number of positions in his Grand Army of the Republic (GAR) post and served as Aide de Camp to GAR Comander-in-Chief John P. Rea. He was responsible for introducing the resolutions recognizing the Sons of Veterans, USA by the Grand Army of the Republic. In 1884, he served as the first Camp Commander of Old Abe Camp 16. He was elected 3rd Grand Division Commander doubling membership and camps in one year. 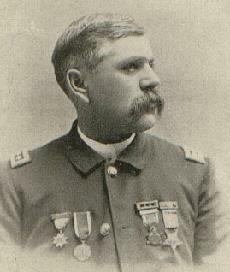 He served as Kansas Division Commander in 1886. He served several national positions including Judge Advocate General. He was elected Commander-in-Chief of the Sons of Veterans in 1890 and served with distinction. He died February 21, 1893.